Kathleen’s Genesis Part 3 Bible Study has been updated and uploaded to our site. This 9-lesson Bible Study on Chapters 37-50 of Genesis takes a look at the Twelve Sons of Jacob and can be downloaded for free. You can find it also on Amazon for purchase in about three weeks. Click here for Free Download of Genesis Part 3 Bible Study. This study, “The Twelve Sons of Jacob”, is Part 3 of the entire Genesis Bible Study. Click here for Part 1, “Adam to Noah”. Click here for Part 2, “Abraham, Isaac and Jacob”. From Kathleen: “These final chapters in the book of Genesis describe for us the character and personalities of the twelve sons of Jacob. I don’t think I’m being overly dramatic when I say: these twelve sons are the future of the world. From these twelve sons and their sons and daughters, and their sons and daughters, and their sons and daughters… will come the leaders and sustainers of the Jewish nation. That nation will fight to survive in a harsh world, fall on their faces often, love their God and more often than not disobey that same God, claim victories, limp away from failures, and still survive to deliver to all of us our Savior. You’ve probably heard and loved many of the stories in this second part of Genesis, Chapters 12-36. In these chapters we meet Abaham, Sarah, Lot, Isaac, Ishmael, Rebekah, Jacob, Rachel, and Esau, and the 12 sons of Jacob, who will become the 12 tribes of Israel. As you study your way through Genesis Part 2, I think you’ll be struck, as I was, at what a total mess this chosen family was. And perhaps you’ll come to the same conclusion I have: all families are dysfunctional in more ways than we know! Genesis Part 2 is full of hope and a little humor for all of us dysfunctionals! This very big, very human family had to learn, just like we do, that the LORD is to be trusted above all others, and especially above themselves. Click here to go look at Genesis Part 2. Click here to take a peek at Genesis Part 1. Click here to view the kathleendalton Bible studies currently available for purchase. Kathleen’s Genesis Part 2 Bible Study has been updated and uploaded to our site. This 16-lesson Bible Study on Chapters 12-36 of Genesis will introduce you to the family of Abraham, the first Jewish family. You’ve probably heard and loved many of the true stories in this second part of Genesis. As you read your way through Genesis Part 2, I think you’ll be struck, as I have been, at what a total mess this chosen family was. Maybe you’ll come to the same conclusion I have: all families are dysfunctional in more ways that we know. Click here for Free Download of Genesis Part 2 Bible Study. 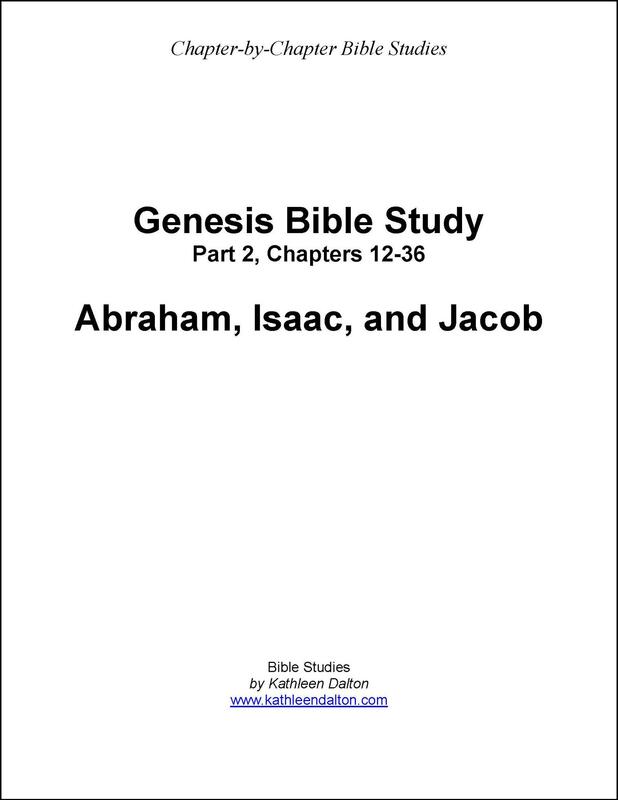 This study, “Abraham, Isaac, and Jacob”, is Part 2 of the entire Genesis Bible Study. Click here for Part 3, “The Twelve Sons of Jacob”. Genesis Part 1, Chapters 1-11, “Adam to Noah”, is Available for Free Download, or for Purchase on Amazon. You could say the whole world was created with you in mind, except that almost sounds like creation was made to revolve around you, and of course, it wasn’t. It was made to revolve around God. This 9-lesson study of the first eleven chapters of Genesis, Genesis Part 1 will start you on an investigation of the mysteries of God, Who can create a world and mankind out of nothing, and give life to the dead. Click here for Free Download of Genesis Part 1 Bible Study. Click here to view this Bible Study for purchase on Amazon.com. This study, “Adam to Noah”, is Part 1 of the entire Genesis Bible Study. We Finish Up Genesis Today – Here are Chapter Notes and Questions…and a Quiz! Today , April 15th, we finish our year-long study of the book of Genesis! (click on the picture to the left to view the whole study) What a great adventure it has been to get to know the first people who inhabited our world. What a blessing they have been to us as we have come to the realization that they are every bit as dysfunctional as we are!!!! Here are the Notes from last week’s lesson on the blessings old Jacob gave to his 12 sons: Chapter 49. And here is our last quiz on Genesis: Chapters 37-50. See how many you can get right without opening your Bible! For the entire Genesis Bible study, click here. To view or download the entire Genesis study, click here. Click on the image to the left to view or download Discussion Questions for Genesis Chapters 44 & 45. These will be discussed at the Genesis Bible Study at the Greenwood Library next Tuesday, March 11th, 1pm. Click here to view or download the entire Genesis Bible study. Click on the image to the left to view or download the notes for Genesis 42&43, our Chapters for yesterday’s Genesis study at the Library in Greenwood. Click here for the entire Genesis study.